Here we have our latest self-fastening stock control key tags under the Rallye brand of quality products. Available in 4 different colours, blue, red, white and yellow each pack contains 200 tags. All packs come complete with 2 marker pens, so you can add each vehicles details to the tag quickly. Once you have finished using a tag you can simply snap off the tail to remove. The Rallye keytags are very easy to use by simply looping the tail of the tag through your keys and fasten back through the tag to lock. These key tags are aimed at car dealerships and service workshops where multiple sets of keys are stored. The tags ensure you can quickly locate the right set of keys to return back to your customers, saving you time. Each pack is supplied in a boxed container for storage. Order more than one box to receive quantity discounts. 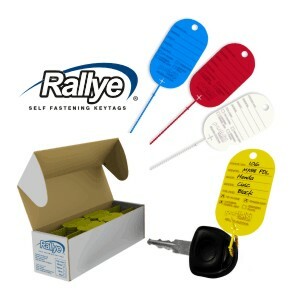 Please could you advise how much you charge for 1 box Rallye Self-Fastening Stock Control Key Tags and any carriage?